Thank you, you have been added to our distribution list! The Fuel Cell and Hydrogen Energy Association (FCHEA) is the trade association for the fuel cell and hydrogen energy industry, and is dedicated to the commercialization of fuel cells and hydrogen energy technologies. Fuel cells and hydrogen energy technologies deliver clean, reliable power to leading edge corporate, academic and public sector users, and FCHEA members are helping to transform our energy future. FCHEA represents the full global supply chain, including universities, government laboratories and agencies, trade associations, fuel cell materials, components and systems manufacturers, hydrogen producers and fuel distributors, utilities and other end users. In her June 21, 2017 speech to Parliament, Queen Elizabeth II announced that her government would introduce an “Automated and Electric Vehicles Bill”. The bill, aimed at satisfying Britain’s environmental policy objectives, called for greater funding for fuel cell vehicles and hydrogen infrastructure across the United Kingdom (UK). In the year and a half since the bill’s introduction, the country’s hydrogen and fuel cell industry has seen some impressive developments. Here are some recent updates in the UK, in both the transportation and stationary power sectors. Hydrogen is among the clean technologies receiving early stage financial support as a part of the UK’s Clean Growth Strategy, launched in 2017. In May 2018, Energy and Clean Growth Minister Claire Perry dedicated £20 million (~$25.8 million) to a Hydrogen Supply program to help businesses reduce the costs of producing large volumes of hydrogen. Also in May, the UK's Institution of Mechanical Engineers released a report calling for the government and energy industry to promote the use of hydrogen as a means of storing energy. According to the Institution, the country’s gas grid has the potential to store excess electricity in the form of hydrogen for a longer duration than some other forms of energy storage, such as batteries. In July, members of the House of Commons and House of Lords announced the formation of an All Party Parliamentary Group (APPG) on Hydrogen. The cross-party group aims to raise awareness of, and build support for large scale hydrogen projects, such as conversion to a hydrogen domestic gas grid that will enable the country to meet decarbonization targets set through the Climate Change Act and the Paris Climate Change Agreement. With £7 million (~$9 million) in funding from the UK Advanced Propulsion Centre, Ceres Power has entered into a partnership with The Welding Institute to further develop fuel cell vehicle technology for FCHEA member Nissan. In August, Ceres Power announced plans to design, build, test and demonstrate a compact, robust, UK-produced solid oxide fuel cell stack. The stack will then be deployed within a Nissan designed fuel cell module suitable for operation with a variety of high efficiency fuel types, including biofuels. 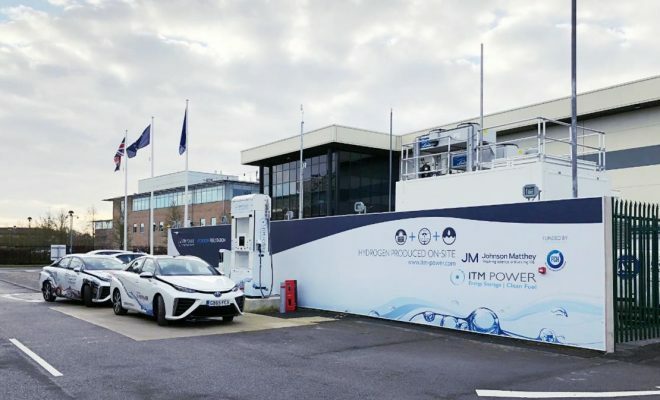 In September, FCHEA member Johnson Matthey held a grand opening for a public access hydrogen refueling station at their Swindon manufacturing facility. Installed by ITM Power, the opening was supported by fellow FCHEA members Toyota, Hyundai, and Honda, and is the seventh public access HRS built by ITM Power in the UK. As Britain’s hydrogen infrastructure expands, the number of vehicles utilizing it is growing, too. With assistance from the UK’s Office for Low Emission Vehicles, Green Tomato Cars, an eco-friendly, London-based taxi service that successfully operated two Toyota Mirai fuel cell vehicles for the past two years, added 50 additional Mirai to their fleet in 2018. This addition comes as part of an £8.8 million (~$11.3 million) project funded by the Department for Transport that will bring nearly 200 hydrogen-powered vehicles to the streets in the near future. In partnership with Toyota, Honda, Hyundai, and Shell, the Department plans to introduce fuel cell vehicles in emergency service and police departments and improve access to hydrogen refueling stations across the country. Alexander Dennis Ltd. (ADL), a British bus manufacturer, is also adding hydrogen-powered vehicles to its product line. This month, the company presented a prototype for a double-decker bus model powered by a fuel cell drive. ADL’s double-decker will add to the growing fleet of fuel cell buses on British roads – as of March 2018, London had ten single-deck hydrogen buses deployed. The need for the UK to further integrate hydrogen fuel cells into the transportation system has been echoed by leaders in transportation policy. In February, the United Kingdom's Minister of State for Transport delivered a speech at the British Museum that promoted the replacement of diesel train engines with hydrogen fuel cells. The Honorable Jo Johnson called for the end of diesel-only trains on British railroads by 2040, and presented hydrogen as a viable solution for sustainable energy rail transport. Chris Grayling, Secretary of the Department for Transport, emphasized the technology transformation expected in the UK rail system in coming years, specifically the introduction of hydrogen-powered trains. With the costs of rail electrification leaving many lines dependent on diesel, the Department for Transport has considered hydrogen-powered trains as a clean, cost effective replacement. In the past year, the British railroad industry has begun to address the challenge set forth by policymakers. Porterbrook Leasing Company Limited, a leading participant in the rail leasing market, has placed an order for a fuel cell module that will power a HydroFLEX train in the UK. Porterbrook will work alongside the Birmingham Center for Railway Research and Education to convert a class 319 electric train into a HydroFLEX hydrogen-powered train. The train will utilize a fuel cell module from Ballard Power Systems. In addition, French train manufacturer Alstom, which has been operating two hydrogen-powered trains in Germany since September, announced their own plans in May to convert electric trains to hydrogen in the UK. Alstom will convert an existing Class 321 train into a Hydrogen Multiple Unit, codenamed “Breeze”, for the Eversholt Rail Group. Alstom expects the Breeze train to be in operation by 2022. In May, Port Glasgow-based Ferguson Marine Engineering announced that they had secured EU funding to develop the world’s first hydrogen powered passenger ferry, with plans to launch a shuttle service between the Scottish islands of Orkney and Shapinsay in 2021. The project will cost around €12.6 million (~$14.4 million), of which €9.3 million (~$10.6 million) will come from the European Union’s Horizon 2020 research and information fund. For the past few years, Orkney has been converting surplus renewable energy into hydrogen directly on site, building sustainable local sources of fuel in parallel with their hydrogen refueling infrastructure. Hydrogen innovation in the United Kingdom has not been limited to the transportation sector. This past October, FCHEA member Intelligent Energy unveiled and displayed the ECO GH2, a hydrogen fuel cell power product aimed specifically at the construction industry, at UK Construction Week (UKCW) in Birmingham, UK. The ECO GH2, jointly developed with British construction equipment supplier TCP, was used by UKCW within the Energy 2018 section to provide silent, zero emission power to the Renewable Energy Theater and to demonstrate the capabilities of the product to attendees. According to Intelligent Energy, the ECO GH2 is zero-emission at point of delivery and has near silent operation, which is beneficial for night-time work and operating in urban areas. Intelligent Energy has also been applying fuel cell power to unmanned aerial vehicles (UAV) alongside venture engineering company Productiv and BATCAM, the UK’s leading UAV filming specialists. This UAV model recently achieved 70 minutes of continuous flight with a 5 kg payload, surpassing the original goal of 60 minutes. With the help of British policymakers, companies at the forefront of fuel cell innovation have found a wide array of opportunities to advance their technologies in the United Kingdom throughout the past year. Increased government attention, more substantial hydrogen infrastructure, and further stakeholder collaboration will position the UK to continue this positive forward momentum.